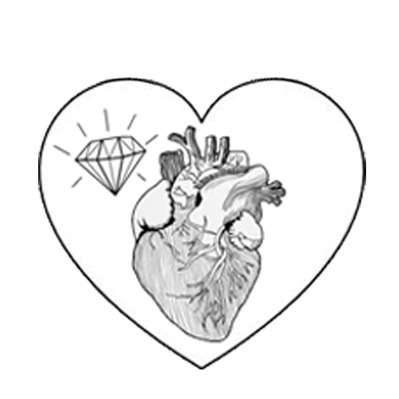 A Diamond Heart Production is an Artist Development Label, Recording, Art, Blog & Publishing Company. Vanessa works closely with bands & artists to help them develop different aspects of their career focusing mainly on Artist Development, Recording, Release Plans, Booking, Art / Image, Grass Roots Marketing & Branding. The label also offers a very community driven home & spirit on the label side as well distribution (Dashgo) for releases. The label prides its self on being a Artist Friendly Music Company with Old School Record Label Traits & a New School State of Mind in the digital age. Vanessa Silberman is a Los Angeles based Singer, Guitarist, Songwriter, independent A&R, Record Producer, Engineer, Graphic Artist, & Entrepreneur. Having worked in the music industry for over 14 years, both as an artist & on the business-side, Vanessa has done everything from Online / Street Marketing (Epitaph Records, Nettwerk Music, V2, WBR) to freelance A&R & Scouting artists for Radio Tech Start-up (Earbits.com). Vanessa has also worked at some of LA's most respected Recording Studio's (Conway Recording, Studio 606 - 8028 Sound City Neve) & assisted Music Execs like Warner Brothers Records past COO CO/President Livia Tortella & assisted, set up partnerships & production coordinated for Music Producer & Song writer Dr. Luke. She also has done Publishing Royalties (Bug Music / Windswept), made Budgets, Contracts & Advanced Tours for Bands (Redbird MGMT) as well as Tour Managed, Settled Shows, Operated Doors or sold Merch at some of the most popularvenues (Bootleg, Troubadour, Silverlake Lounge) in LA. Vanessa has covered a lot of ground, had just about every job in the industry & worked with some of the biggest names in the business. Visit Vanessa's Allmusic Credits. With a unique background Vanessa can give both artists & industry work & insight that is both effective & different from the norm. Vanessa's most recent independent Recording & Production credits range from (More info / updates coming soon): Los Angeles rock pop alternative punk band WaveBreaker • New York punk garage grunge band EX-Girlfriends • Boston garage indie blues rock trio Ski Bunny • Boston progressive indie rock sister band Circus Trees • New York songwriter violinist producer Margot • San Francisco psych punk garage songwriter Jimmy Dias • Chicago rock band The Punch • Netherlands Pop Disco Sarcastalites • Atlanta musician & illustrator Keith E. Lee • Chicago Punk Rock sibling band The Magnifiers • Partnering with Record Label: Tshukudu / Bop Recording Studio for a Artist Development Recording project working with Hip Hop group: Hash One from the Mafikeng, South Africa • Plus more!